RailLexic is UIC’s terminology database and the leading reference in the field of multilingual railway terminology. The database contains approximately 16,000 terms in the following 23 languages: Arabic, Czech, Danish, Dutch, English, Esperanto, Finnish, French, German, Hungarian, Italian, Japanese (not yet complete), Norwegian, Persian, Polish, Portuguese, Romanian, Russian, Serbian, Slovak, Spanish, Swedish and Turkish. For each term, you will find the translations, variants of the term, subject fields and grammatical information. There are also definitions for about 3,000 terms. Many terms carry an explanatory note and context to clarify the meaning of the term. Moreover, the terms in RailLexic are classified into 105 railway-specific subject fields. 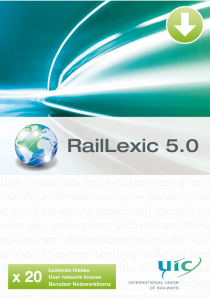 RailLexic 5.0 is available online as a subscription or may be purchased and downloaded. This version must be installed on a computer and is compatible with Windows XP, Windows 7, 8.1 and 10. The network licences are concurrent user licences. Please note: The network installation has to be installed on a network server first and installed on every workstation afterwards. Users need to have read and write access to the installation directory on the server. UIC has been publishing multilingual dictionaries with railway terminology for decades. They have become valuable tools for all those working in the international railway sector in need of technical vocabulary. In the 1990s, UIC began editing a CD-ROM, called RailLexic, in addition to the print dictionaries. RailLexic currently covers 23 languages with translations being done by experts of the individual railway companies. The following languages are available in the terminology database: Arabic, Czech, Danish, Dutch, English, Esperanto, Finnish, French, German, Hungarian, Italian, Japanese (not yet complete), Norwegian, Persian, Polish, Portuguese, Romanian, Russian, Serbian, Slovak, Spanish, Swedish and Turkish. Each language contains around 16,000 entries. The “UIC Railway Dictionary” is the print edition of the RailLexic database in the following three languages: English, French and German. It contains some 16,000 terms, with subject fields and grammatical information indicated for each term. The RailLexic mailing list is an electronic discussion and information forum for all those dealing with railway terminology, translations in the railway field and technical background information (in printed form and on the web), etc. It is a moderated list and you can choose a digest option in order to receive messages no more than once a day. If you are looking for a technical term related to railways, a definition for a railway concept or trying to find a text book or an Internet site on a railway topic, you can post your query to the list and will hopefully get an answer from another subscriber. You can also simply share information you consider to be of interest to other members of the list. In this way we can help each other and form a network of railway specialists. You will then receive all the necessary instructions.